To edit FinalBuilder's Source Control Integration options, go to Tools menu | Options then click on the FinalBuilder category and the "IDE Source Control" item. • Enable Source Code Control Integration: If this option is disabled, no SCC integration will be offered. FinalBuilder Projects which are bound to Source Control will have these bindings ignored. • Disable when running a project from the command line or scheduler: If this option is enabled, no SCC integration will be offered when the FinalBuilder IDE is running a project passed in on the command line, or running from the scheduler. Note that this option only applies to the FinalBuilder IDE. No SCC Integration is available at all when running from the FBCMD command line application. This is because most SCC Integration Provider Plugins display graphical dialogs which FinalBuilder cannot control. This option will default to the last source control provider you selected, and is the provider which will be selected the next time the "Choose Provider" dialog is shown. Select "Always use this source control provider..." to skip the "Choose Provider" dialog when binding new projects. FinalBuilder can be set to automatically perform certain SCC operations when bound projects are opened, saved and/or closed. • Refresh status on open: Connects to the SCC repository and checks the project's status when opening a project. • Get latest version on open: Automatically retrieves the latest version of the project from the SCC repository when opening. • Check out on open: Checks out (locks) the project when opening it. • Check out before saving: Checks out (locks) the project when saving it. • Check in on close: Checks the project back into the SCC repository when the project is closed. Note: When using this option, if a new project data file appears is not yet in source control, the FinalBuilder IDE will report that the entire project is not bound to source control. 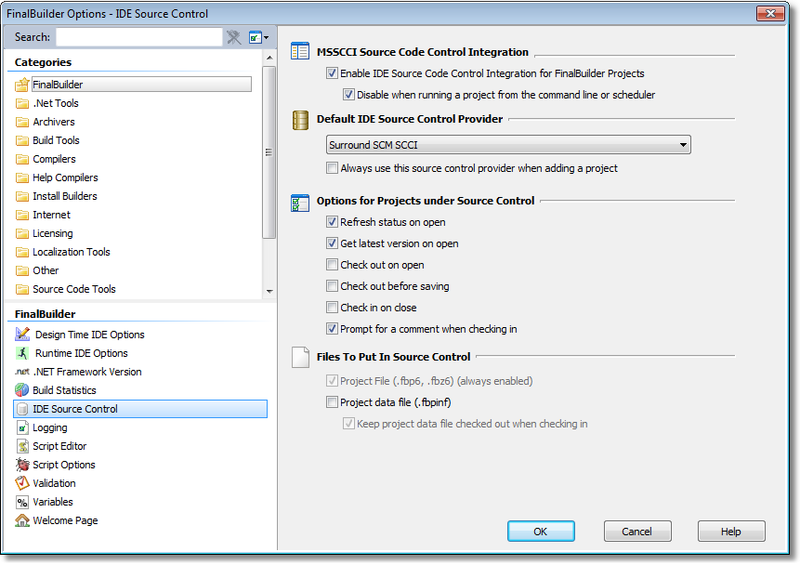 Choose the "Add Project to Source Control..." command to add the missing file and restore normal SCC status. It should not be necessary to re-enter provider or binding information. Note Also: Log Files cannot be automatically added to Source Control. It is recommended that FinalBuilder Log Files are never added to Source Control under any circumstances, as they are likely to impact detrimentally on the Source Control system's performance. Log files are large binary files which change substantially during a run.